The Tropf Blumat system is utterly flexible. 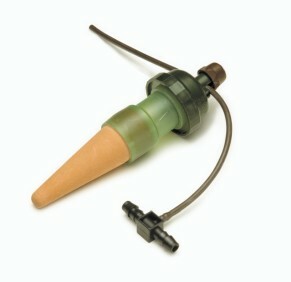 Each Tropf Blumat unit irrigates ground in diameter of 20 to 25 cm. 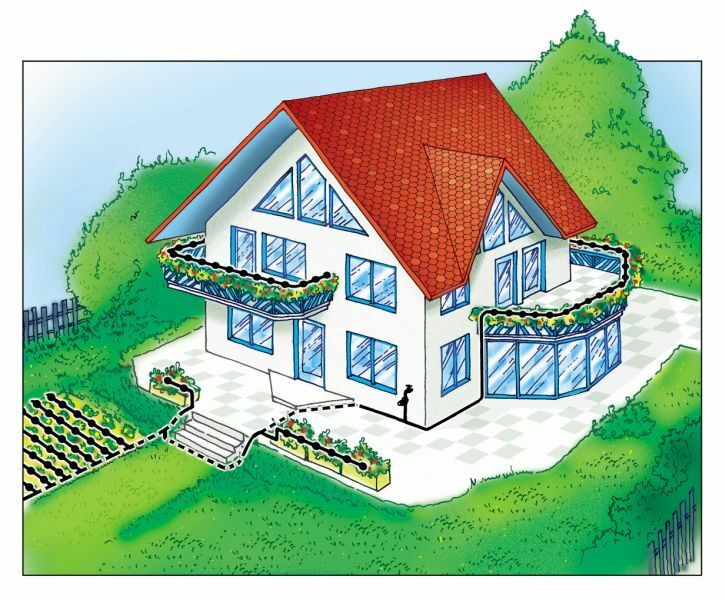 It can be used for all plants outdoors, regardless whether on balconies, windows, terraces, roof gardens, in green houses. Plants with different water consumption can be easily combined since each Tropf Blumat unit regulates only the soil moisture in which it sits. The best way to supply water is to connect the Tropf Blumat system to the water tap. If no water tap is available an elevated tank can also be used. The tank has to be elevated by 10cm for each meter length of your watering system, but not less then 50cm. The complete sets to start with contain 12 dripping units in the Tropf-Blumat set for: 3m irrigated length and 40 dripping units in the Tropf-Blumat set for 10m length. All necessary connectors and tubings are included. The bigger set already comes with a pressure reducer for connection to a ¾ '' tap. Subsequent amendments are of no problem. 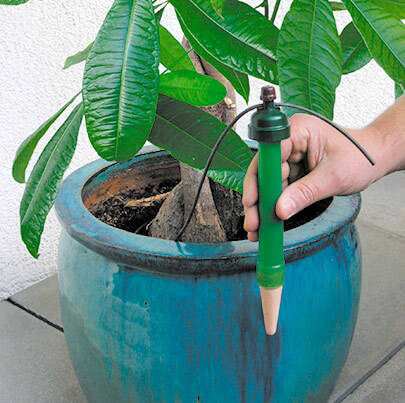 If you want to insert new plantings into your existing watering system, all you need is a scissor and additional tricklers. Dependent on your needs you can extend the system to up to 250 tricklers per one supply tubing, using the T-branch connector even to up to 500. So even really spacious arrangements of plants can be irrigated. Różne zastosowania prezentujemy w gallerii. 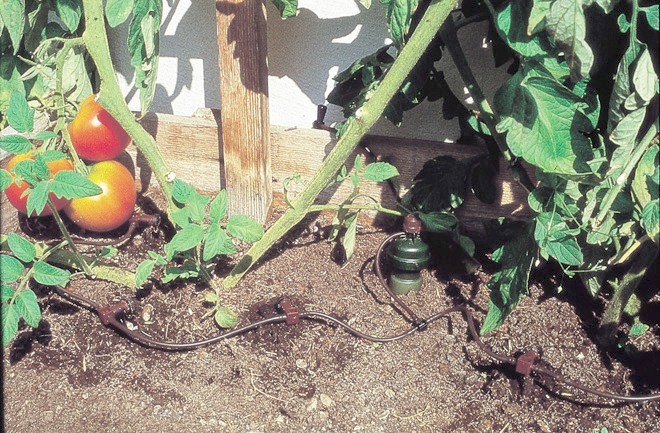 For the accurate irrigation of plants in larger plant containers, bushes, and perennials, it’s necessary to measure the moisture deeper in the soil, since in this cases the roots are deeper. The best solution here is Tropf-Blumat-Maxi. Its longer shank guaranties the ideal degree of humidity on the spot of the roots. Both Tropf Blumat and Tropf Blumat Maxi can be used in conjunction with z distribution tricklers. This allows for a very economic way of irrigating several plants of similar water consumption, controlled by only one Tropf Blumat. Up to 5 distribution tricklers can be chained up, which distribute the water evenly on long bed rows or large-size plant containers for example. The first distribution trickler ought to be situated in approx. 12-15 cm distance from the controlling Tropf Blumat. The first one provides the feedback to the sensor. The other distribution tricklers have a distance of 20 to 25 cm each to the previous one. Tropf Blumat is intended for outdoor usage. For irrigating your room plants or other plants with little water consumption we recommend Blumat for room plants.